Powerful testimonies of Evangelicals who became Catholic. These eleven personal conversion accounts are unlike any you've ever read. They're packed with biblical, theological, and historical proofs for Catholicism. Each year thousands of atheists, Evangelicals, Mormons, Fundamentalists, and Pentecostals are being surprised by Catholic truth and these converts tell you why. 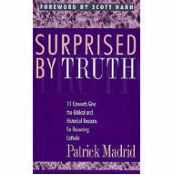 In his foreword Scott Hahn described his reaction to Surprised by Truth: "While reading each of these incredible journeys I laughed, cried, grunted affirmations, and basically relived my own journey into the Catholic Church. I heard echoes of my own struggles in their words. I relived the anguish I experienced on that lonely and sometimes frightening path of conversion, and I relived the deep, abiding joy of coming home." But enough... read these stories. They're prayerful, heavy-on-doctrine, evangelical, scriptural witnesses of people who discovered that what they had once thought was the most "unbiblical" church is really the Church of the Bible.